Once parents start to feed their baby solid food, they should consider starting regular oral hygene. Baby teeth are important for chewing which is needed for proper nutrition and that is why they should be taken care of. Tooth Tissues are uniquely textured for plaque removal, neutral flavored, fluoride-free, paraben-free and sugar-free, and 99% natural. 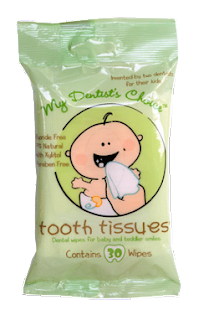 They were specially designed to help remove plaque from your baby and toddler’s teeth and gums and are perfect for busy new parents eager to get their child off to a healthy start.